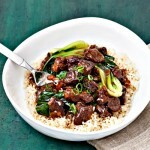 This Asian inspired beef stew has a deep earthy flavor from the five-spice powder and a hint of orange and ginger. 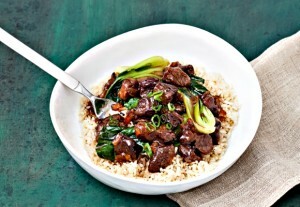 Trim any excess fat and sinew from beef; cut into () pieces. In fry pan, heat the oil until shimmering. Brown the beef cubes in batches. Do not overcrowd. Place in slow cooker. After the beef has been browned, add onion to frying pan and sauté until translucent, add the ginger and garlic cook for 1 minute. Add the marmalade, soy sauce, brown sugar, five-spice powder, orange zest, salt & pepper, stir in broth and orange juice. Bring to a boil. 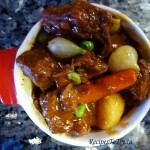 Pour over the beef in the slow cooker. Cover and cook on low for 6 to 8 hours. Whisk cornstarch with 2 tbsp water; whisk into slow cooker. Stir in bok choy. Cover and cook on high until slightly thickened and bok choy is wilted, about 10 minutes. Stir in green onions and cilantro. Cook bacon until crisp in large skillet, reserving drippings. Remove bacon and crumble. Shake beef with flour, salt and pepper in plastic bag to coat well. Brown beef about half at a time, in drippings in skillet. Transfer to a 3 L (3-quart) casserole. Add onions, mushrooms and parsley. Stir broth, wine mustard, brandy, thyme garlic and any remaining flour into drippings in skillet. Heat to boiling, stirring to loosen brown bits. Pour over beef and vegetables. Add bay leaf. Bake, covered at 180 C (350 F) for 1 ½ to 2 hours, or until tender. Remove bay leaf,. Stir in crumbled bacon. See “How to Peel Pearl Onions” in “Food & Cooking Tips” to quickly peel these small onions or 4 large onions peeled and quartered can be substituted. In large Dutch oven or heavy bottomed saucepan heat 1 tsp of the oil over medium heat; cook onions and celery, stirring occasionally, until softened about 7 minutes. Scrape into a bowl and set aside. Toss together beef, salt and pepper. Add reaming oil to pan; heat over medium high heat, cook beef in batches and stirring occasionally, until browned about 6 minutes. Remove each batch before adding next one. When last batch is done. Stir in garlic; cook, stirring, until fragrant, about 1 minute. Add all the beef and onion mixture, ginger, cinnamon, allspice and bay leaves, cook, stirring for 1 minute. Stir in broth, wine, vinegar, brown sugar and Worcestershire sauce; bring to a boil. Reduce heat, cover and simmer for 1 ½ hours. 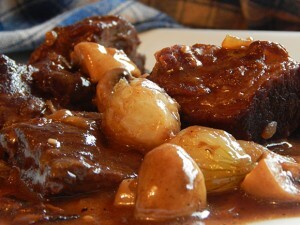 Stir in carrots, turnips, prunes and apricots; cook, stirring occasionally, until turnips are tender about 45 minutes. Discard bay leaves. Whisk flour with cold water; whisk into stew. Simmer until slightly thickened about 10 minutes. Adjust oven rack to lower-middle position and heat oven to 300 degrees. Combine garlic and anchovies in small bowl; press with back of fork to form paste. Stir in tomato paste and set mixture aside. Pat meat dry with paper towels. Do not season. Heat 1 tablespoon vegetable oil in large heavy-bottomed Dutch oven over high heat until just starting to smoke. Add half of beef and cook until well browned on all sides, about 8 minutes total, reducing heat if oil begins to smoke or fond begins to burn. Transfer beef to large plate. Repeat with remaining beef and 1 tablespoon vegetable oil, leaving second batch of meat in pot after browning. Reduce heat to medium and return first batch of beef to pot. Add onion and carrots to Dutch oven and stir to combine with beef. Cook, scraping bottom of pan to loosen any browned bits, until onion is softened, 1 to 2 minutes. Add garlic mixture and cook, stirring constantly, until fragrant, about 30 seconds. Add flour and cook, stirring constantly, until no dry flour remains, about 30 seconds. Slowly add wine, scraping bottom of pan to loosen any browned bits. Increase heat to high and allow wine to simmer until thickened and slightly reduced, about 2 minutes. Stir in broth, bay leaves, thyme, and salt pork. 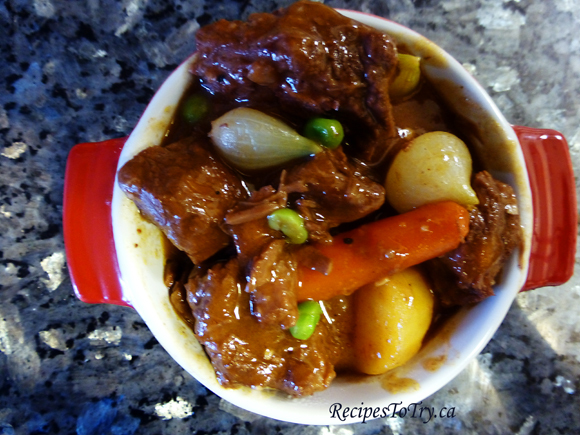 Bring to simmer, cover, transfer to oven, and cook for 1½ hours. Remove pot from oven; remove and discard bay leaves and salt pork. Stir in potatoes, cover, return to oven, and cook until potatoes are almost tender, about 45 minutes. Using large spoon, skim any excess fat from surface of stew. 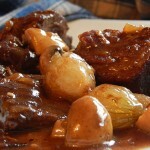 Stir in pearl onions; cook over medium heat until potatoes and onions are cooked through and meat offers little resistance when poked with fork (meat should not be falling apart), about 15 minutes. Meanwhile, sprinkle gelatin over water in small bowl and allow to soften for 5 minutes. Increase heat to high, stir in softened gelatin mixture and peas; simmer until gelatin is fully dissolved and stew is thickened, about 3 minutes. Season with salt and pepper to taste; serve. If you can't find salt pork 2 oz of bacon is a good substitute. 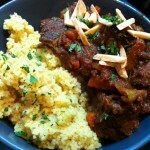 Use a good-quality, medium-bodied wine, such as Côtes du Rhône or Pinot Noir, for this stew. Try to find beef that is well marbled with white veins of fat. Meat that is too lean will come out slightly dry. Four pounds of blade steaks, trimmed of gristle and silver skin, can be substituted for the chuck-eye roast. While the blade steak will yield slightly thinner pieces after trimming, it should still be cut into 11/2-inch pieces. Look for salt pork that is roughly 75 percent lean. 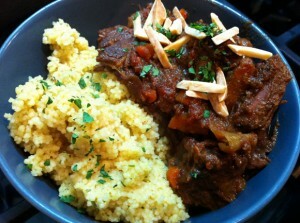 The stew can be cooled, covered tightly, and refrigerated for up to 2 days. Reheat it gently before serving.